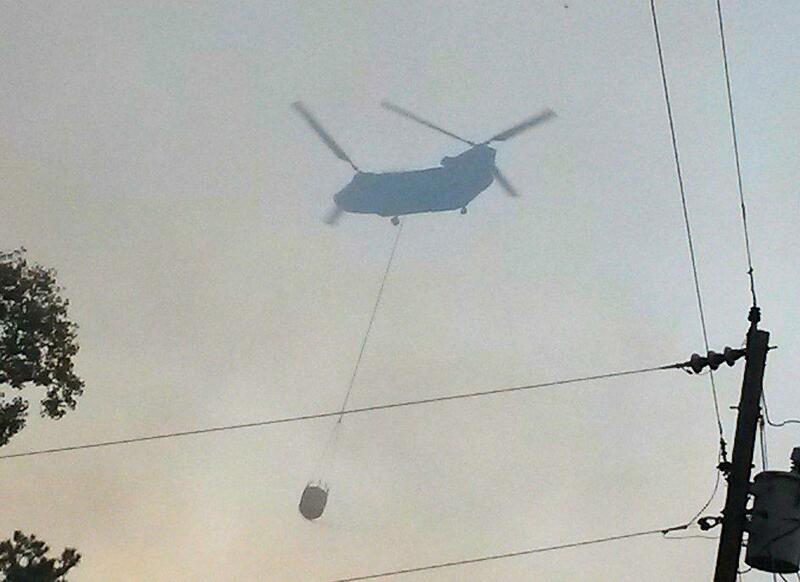 A Chinook helicopter flies over the woods near Barnum Loop and releases water in an effort to put out a large forest fire (photo by Grady Cain). 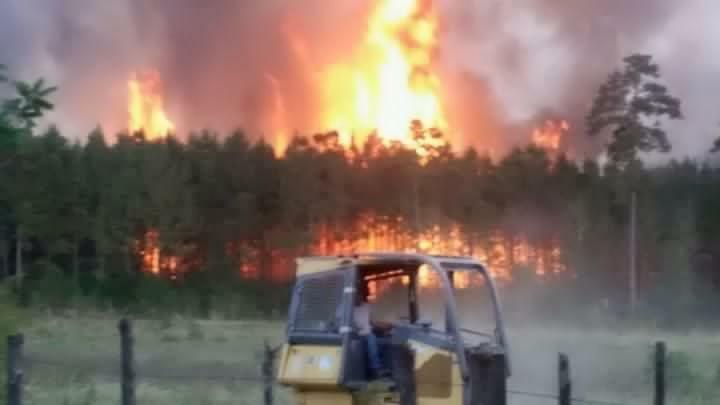 1,000 Acres Burned So Far in Large Forest Fire, BARNUM LOOP, October 18, 2015 - A large forest fire that was allegedly started by a camp fire from a nearby deer camp is possibly the cause of a very large forest fire in the vicinity of Barnum Loop (off FM-287 East). Firemen from all over East Texas including fire departments from Corrigan, Livingston, Onalaska, and Scenic Loop and many other fire departments from outside Polk County were dispatched to the scene. Additionally, the Texas Forest Service, Polk County Emergency Management Coordinator, Larry Pitts, Polk County Sheriff Ken Hammack, local State Troopers, and some Tyler County law enforcement and resources were also dispatched. 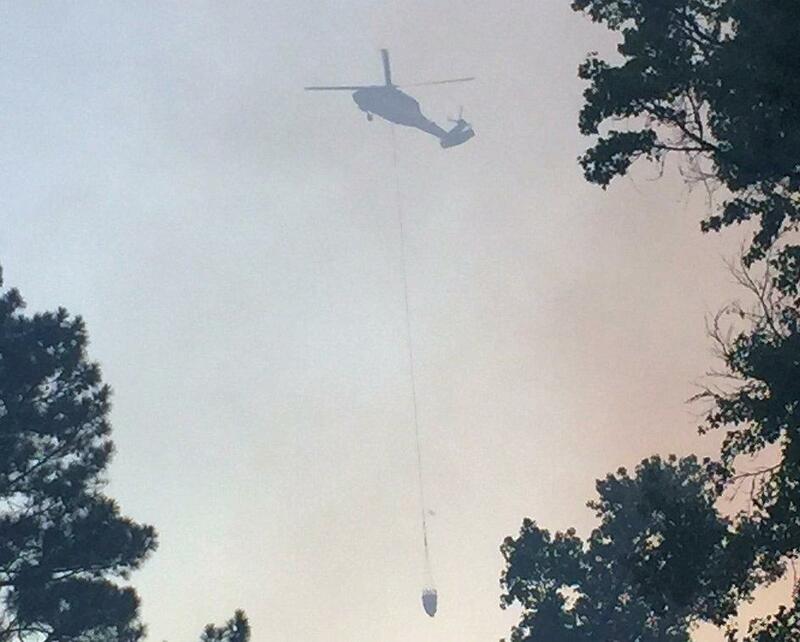 Several helicopters and airplanes were also brought in to help get the fire under control. At time of press, nobody has been injured and there have been no structure fires. 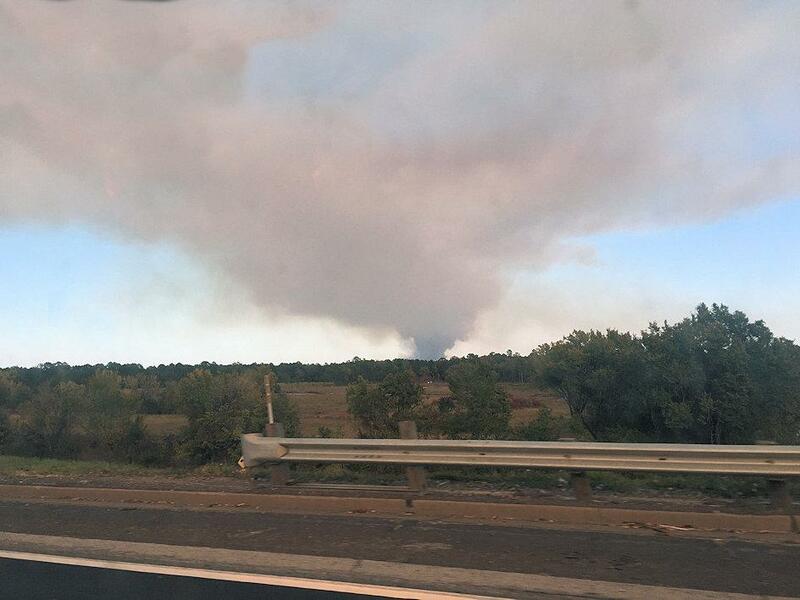 Editor's Note: Livingston Fire Department committed all their resources to help fight this forest fire. While they were gone, it was coordinated for South Polk County, and Holiday Lake Estates VFDs to cover the Livingston area in their absense. 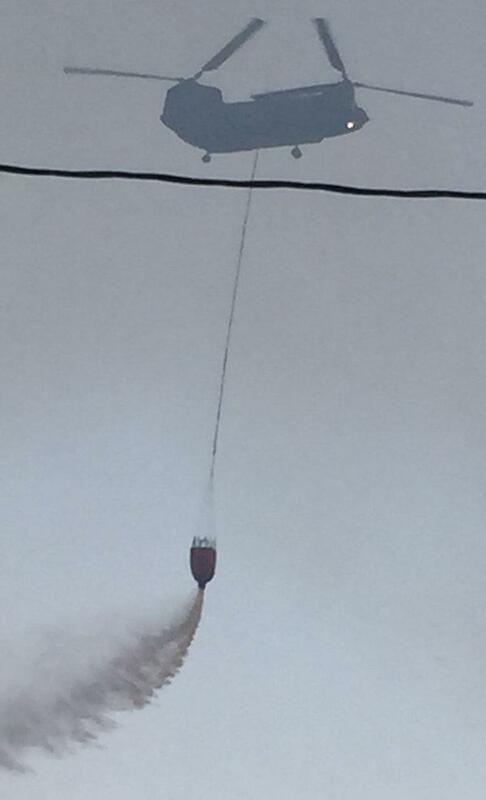 This cell phone image was sent in by a fireman. 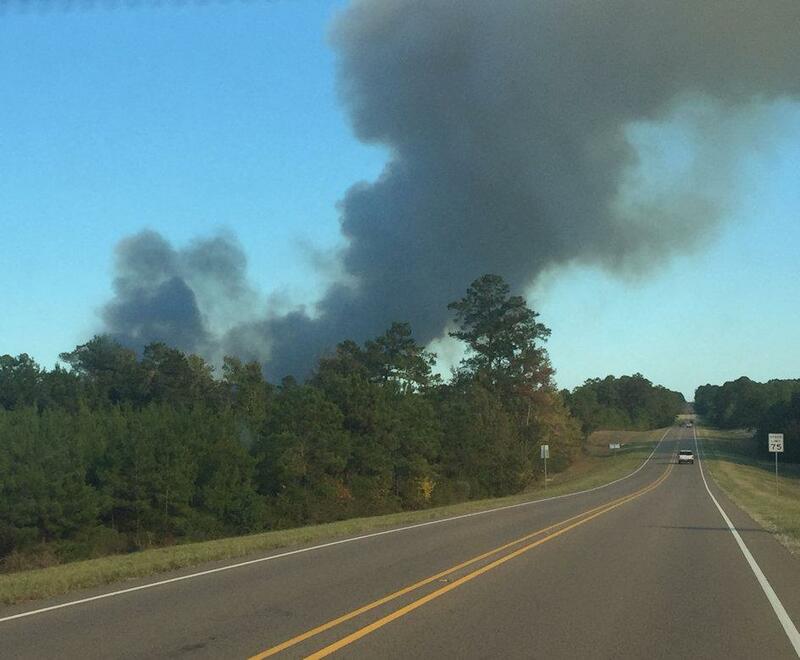 A massive column of smoke could be seen from miles away (photo by Grady Cain). A Black Hawk helicopter prepares to release water (Photo by Grady Cain). Workers with the Texas Forest Service were called in. Firemen from Woodville head to the hot spot. Livingston Fire Chief, Corky Cochran had a busy day fighting fires. The Texas Forest Service brought in a massive plow. Volunteers were handing out Whataburgers and water to firemen and law enforcement. Local dogs were clearly nervous from all the activity.